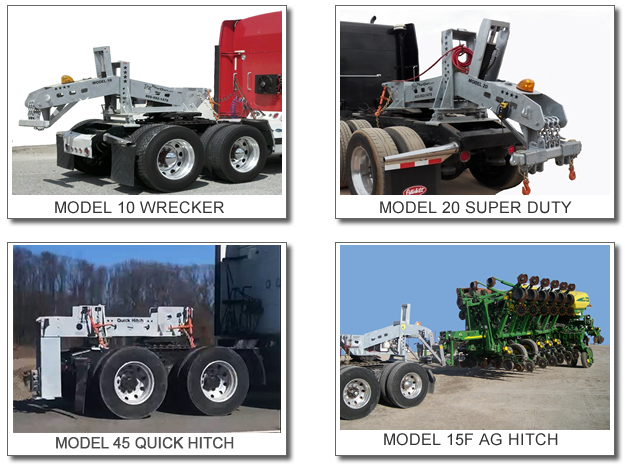 The average fifth wheel tractor packs 400-500 horsepower of working might capable of pulling 30 Tons or more. With the right "adapter" you can tow most anything imaginable. Whether you are a trucking company that needs to rescue a stranded truck or a truck wrecker service that could use a low cost long distance tow truck or a farm implement dealer that does not want to make deliveries with a farm tractor, we have an affordable solution for you. The towing units we offer utilize a temporary mount system allowing your tractor to quickly return to service as a semi once the towing job is done. Get the most out of your investment by utilizing the versatility found in your ordinary fifthwheel tractor. Tow your own truck. Tow your own tractors. Tow your own Implements.